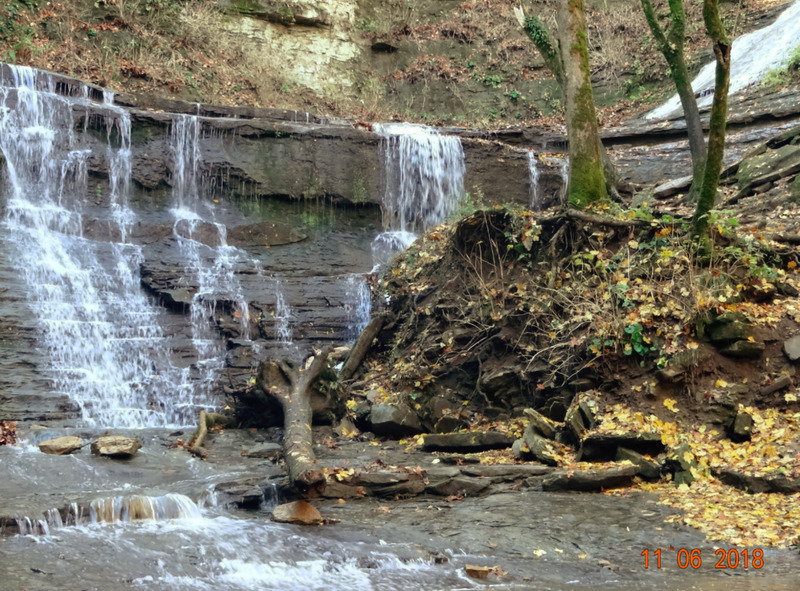 A visit to Jackson Falls and Stillhouse Hollow Falls in Tennessee. 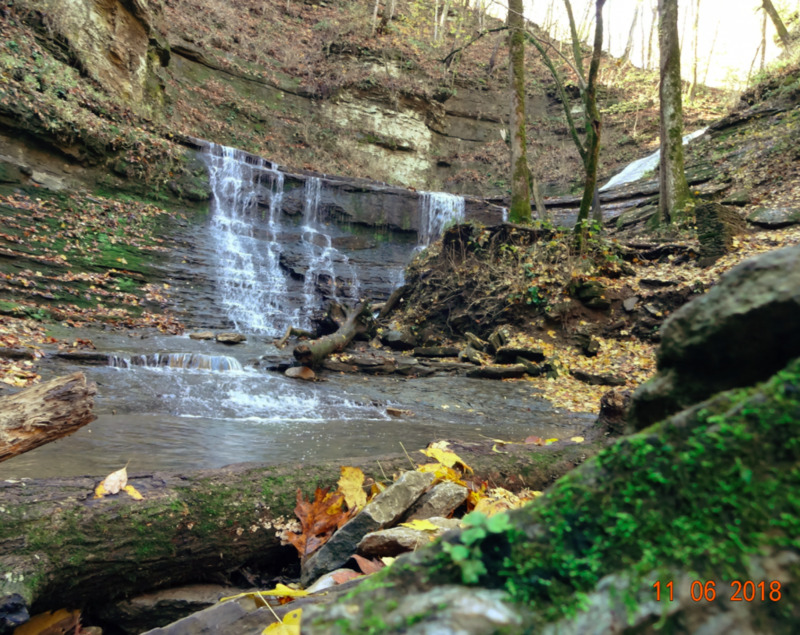 I enjoyed visiting both Jackson Falls and Stillhouse Hollow Falls, and I have photos and videos of both falls below. 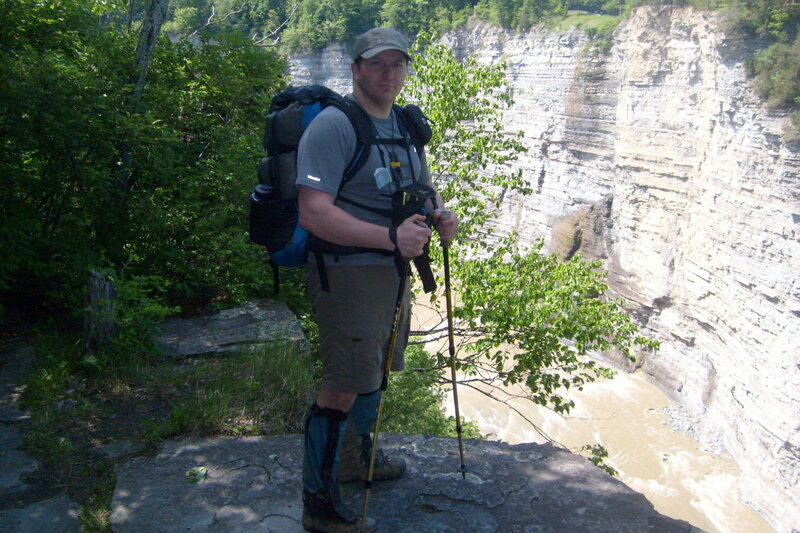 The Jackson Falls trail is paved and much easier and shorter than the trail to Stillhouse Falls. I saw families with small children there. Stillhouse Hollow Falls is a slightly more rugged trip, and the falls have a ledge that is both tempting and a little hazardous. I have seen pictures of children climbing on the ledge that goes behind Stillhouse Hollow Falls. I wouldn't be comfortable letting my children climb on that ledge, but then I wasn't really comfortable climbing on it myself, so maybe it's just me. It would be easy to slip if you are not very careful. When it comes to heights, I am very careful. I hope that statement makes my wife feel better. She was not thrilled when she saw the video of me on that narrow ledge behind Stillhouse Hollow Falls. 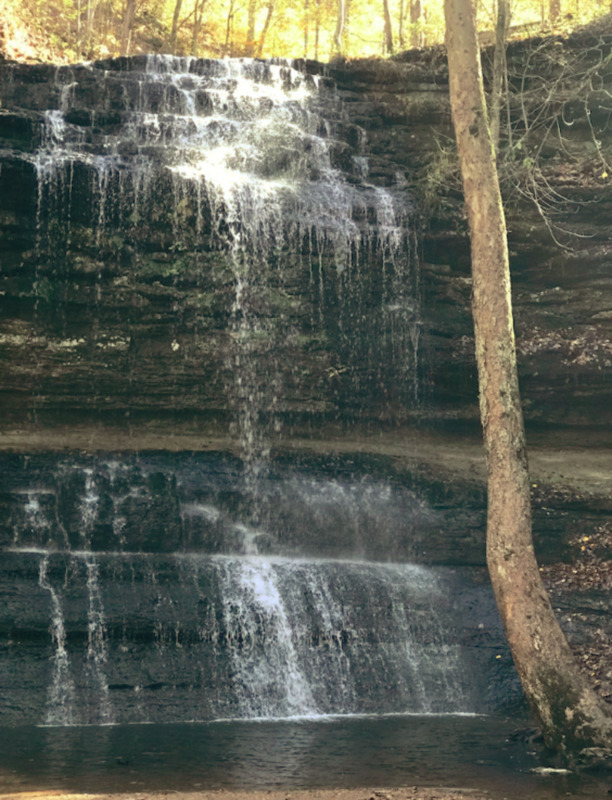 Jackson Falls Tennessee on the Natchez Trace Parkway. 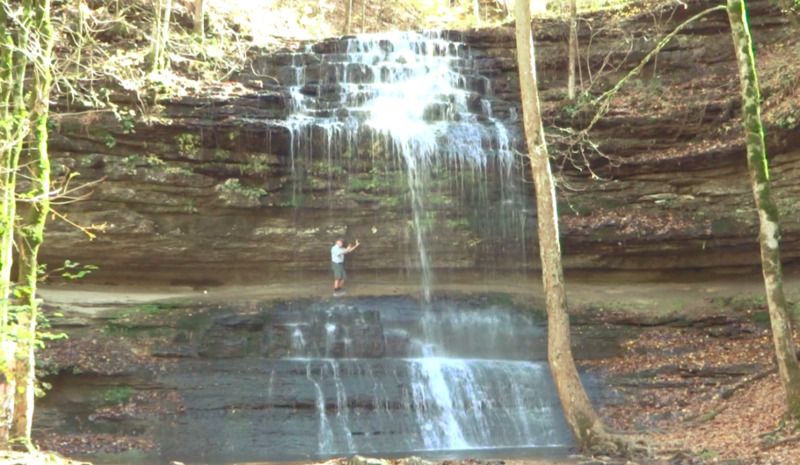 Jackson Falls is less than an hour from my middle Tennessee home and is located on the Natchez Trace Parkway at milepost 404.7. The parking area includes a large bathroom facility and picnic area. The Baker Bluff Overlook with a beautiful view of the valley below is less than 1/2 mile from the Jackson Falls parking area. The falls were not crowded this November day. There were a couple of cars in the parking lot when I arrived, and by the time I left, several more had arrived. Parking lot directly off of the Natchez Trace Parkway. The area has restrooms and picnic areas. The trail marker below says: "This trail descends to Jackson Falls, a beautifully sculptured cascade that seems ageless. But it isn’t. For thousands of years before the falls existed, Jackson Branch flowed into this high valley, isolated from the Duck River below. 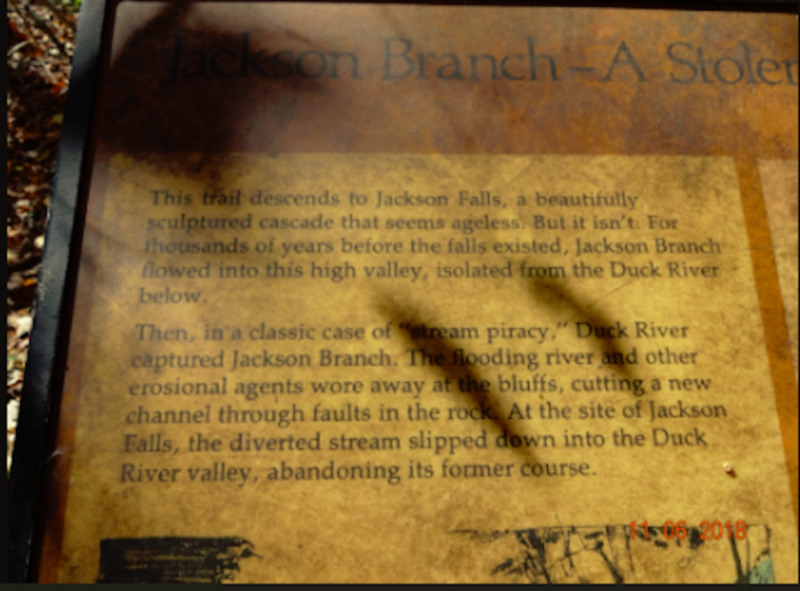 Then in a classic case of “stream piracy,” the Duck River captured Jackson Branch. 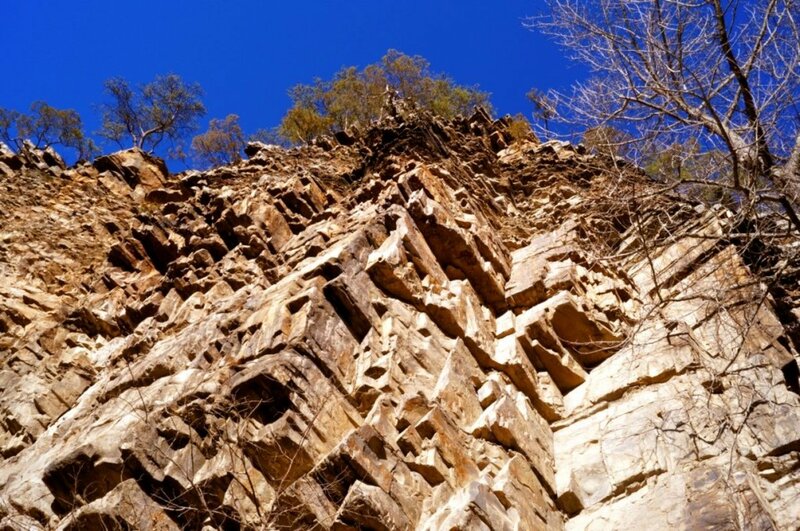 The flooding river and other erosional agents wore away at the bluffs, cutting a new channel through the faults in the rock. At the site of Jackson Falls, the diverted stream slipped down into the Duck River valley, abandoning its former course." 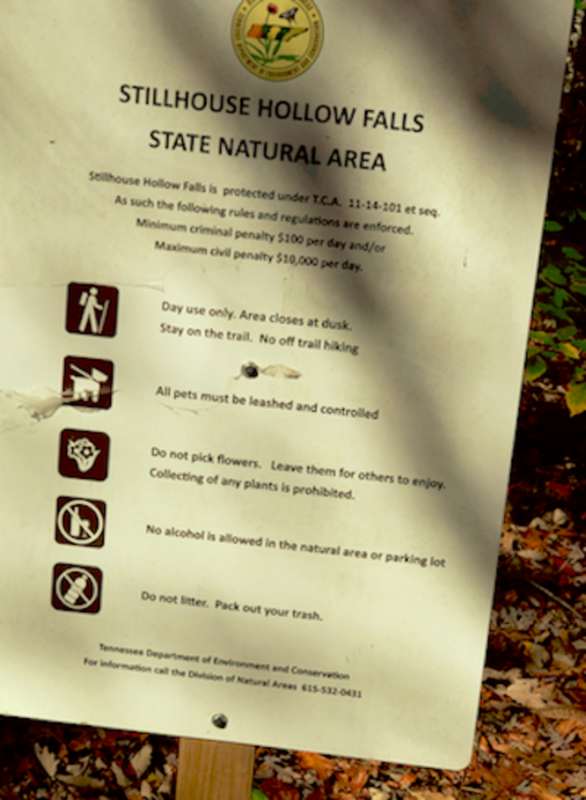 Stillhouse Hollow Falls is 25.5 miles from Jackson Falls. 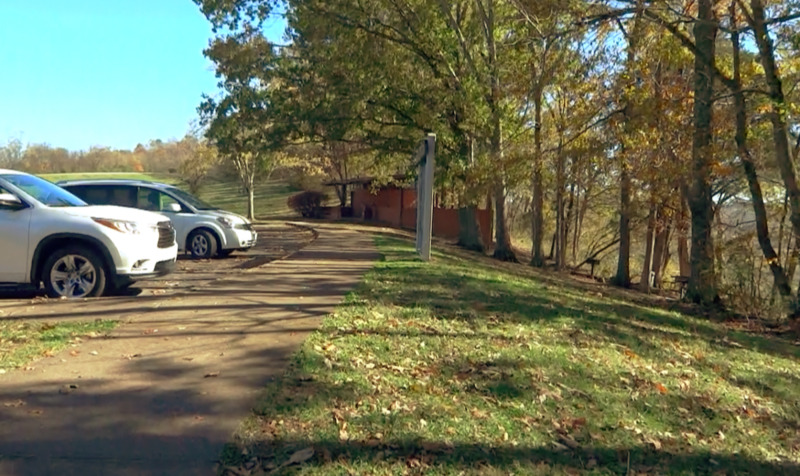 The parking area has a rocky steep drive that does not even look like a road. It is directly off of Highway 43 near Mount Pleasant Tennessee. The trail to the falls is approximately 2/3 of a mile from the parking area, and it has some steps and bridges to help cross steep areas and creeks. When you arrive at the falls you are near the top. The trail to the right takes you to the top of the falls. The view is nice, but the real view is seen by taking a left when you reach the falls. 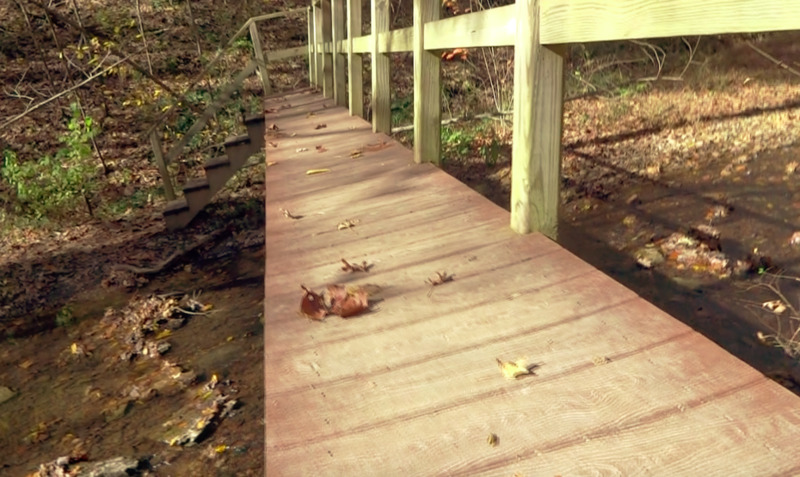 The path to the left also has some steep areas with stairs, and there is a bridge over a creek. After you cross that bridge, the trail turns back to the right and heads toward the falls. Day use only. Area closes at dusk. Stay on the trail. 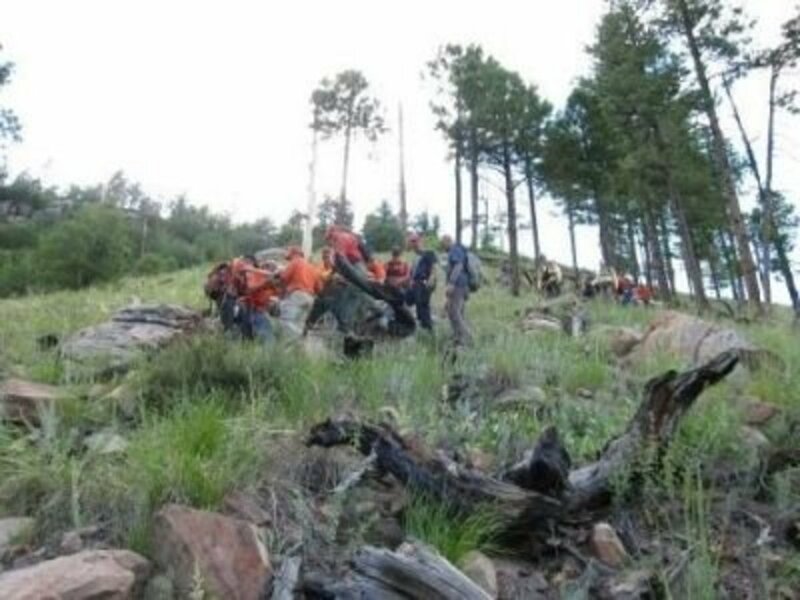 No off trail hiking. Do not pick flowers. Leave them for others to enjoy. Collecting of any plants is prohibited. No alcohol is allowed in the natural area or parking lot. Do not litter. Pack out your trash. 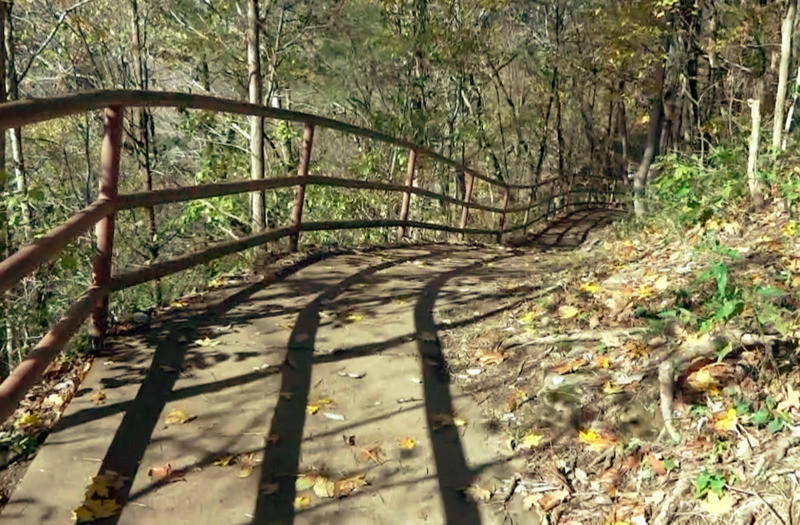 This is one of the longer and narrower bridges on the path to Stillhouse Falls. A narrow, slippery rock ledge goes part of the way behind the falls. I could only walk about 1/3 of the way behind the falls, because the narrow ledge becomes very steep, and gets even more narrow. Thank you, Norma Davis. I appreciate your comment. I love waterfalls too. Nature is filled with incredible beauty. Your presentation was inspiring. I have been wanting to travel and I love waterfalls. Thank you for developing this educational journey. Poppy, thank you for the kind words. We love living in Tennessee. What lovely photos and lots of information about this place. I briefly lived in Tennessee in the summer of 2014 and sometimes went on nice hikes like this. I would love to visit the USA again as the people there were always very friendly and welcoming. Thank you, Liz Westwood. I very much appreciate your comment. This is an interesting and well-illustrated article.